Sit on the lat pull-down machine with your thighs positioned snugly under the supports. Grasp the double-row V handle. Your arms and shoulders should be fully extended upward. Exhale as you pull the handle down until it touches your upper chest. Squeeze your back muscles and hold for a count of two. Inhale as you return the handle to the starting position. Pull the handle down with your back muscles, not with your arm muscles. Extend your arms fully on the return phase. As with the reverse-grip lat pull-down, the close neutral grip lat pull-down emphasizes the lower fibers of your latissimus dorsi, helping you to develop lats that run farther down your sides. For many gym-goers, the close neutral grip is easier on the wrists than using a close overhand grip. 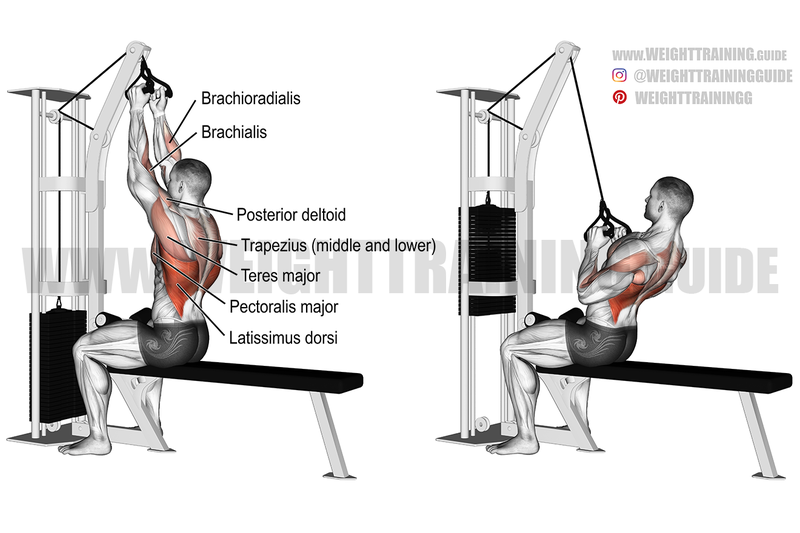 With the close neutral grip lat pull-down, your biceps brachii only act as dynamic stabilizers, along with the long heads of your triceps brachii. Which pullup is best for lats?